A Lesco Spreader is a considerable investment and you need to be armed with these facts before you purchase one. As winter turns to spring it is time to dust the Lesco Spreader out of the garage or at the very least consider in investing in one. As landscape aficionados around the world are aware, Lesco Spreaders are very effective broadcasters for applying insecticides, seeds, and fertilizer to your garden or lawn. Without one of these great little devices you risk putting down too much or too little. Too much will end up burning your lawn or garden and too little will prove ineffective against the onslaught of bugs and creepy crawlies. In this article we would like to explore the world of the Lesco Spreader and inform you of how to get the most out of this great little product. As we mentioned previously a Lesco Spreader is a broadcaster, but what exactly how does this nifty little device work? We will be answering this question now. The concept behind a broadcast spreader is quite simply actually. You need two main parts, a large "pot" (i.e. : hopper) to hold the substance and a "horizontal spinning disk" to apply it. This spinning disk has anywhere from 3-4 "fins" attached to it and it is these fins that spread the substance (i.e. : fertilizer, insecticide, etc.) away from the "pot" and over your lawn or garden. Some broadcast spreaders have the ability to set the direction of the fins, thereby controlling the direction of where the substance will be applied. These "hoppers" as they are called are typically made out of painted steel, stainless steel or even plastic. Stainless steel, although more expensive, is the material of choice for large commercial units as fertilizer can be rather corrosive and this will ensure that the product lasts longer. Because of its basic design, all broadcast spreaders need some sort of power supply in order to get the disk spinning. If the unit in question is a hand carried model, the power will more often than not be supplied by a hand crank. For pushed broadcasters with wheels, the wheels on the unit will spread shaft which in turn will spin the disk which will spread the material. 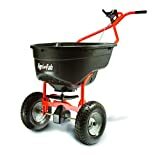 We should also add that it is possible to get broadcast spreaders for garden tractors that will make use of a 12 volt motor to actually spin the disk. We would now like to offer some tips so that you can make use of your Lesco Spreader as soon as it is "out of the box" if you will. Here's the basic operation for spreading material on a 1000 square foot area. Pour the material (i.e. : fertilizer, insecticide, seed, etc.) into the spreader. The bag of the material should have recommended setting for application. Here's an example...if the bag suggests that you use 20 lbs. of product for 1000 square feet of yard or garden, turn your Lesco Spreader dial setting to 20. Put a 12 foot square tarp down on a flat spot in your lawn or garden. Measure out a 10 foot by 10 foot section onto the carp and mark it. Pick a corner and push your Lesco Spreader down the marked off section from one end to the other. When you have reached the end of the tarp turn around and go back...pushing the spreader all the way and making sure that you do not overlap. Walk briskly...let's say about 3 miles per hour. When you are done get off the tarp and roll one side of it to the other trying to keep the material in the section that is generated in the middle. Gently pour the material into a jar. Place the jar with the material on a bathroom scale and record the weight. Pour the material back into the bag that it came in and then record the weight of the empty jar. When you subtract the weight of the empty jar from the weight of the full jar you will have the weight of the product that you need to distribute on a 10' x 10" area. Let's try an example. Suppose the total weight of the jar and product is 2 lbs and the jar itself weighs 0.5 lbs. This means that the product weighs 1.5 lbs. So, what have we learned so far? We know that it takes about 1.5 lbs of product to cover 10' x 10'. Since 1000 square feet is 10 times this amount, we simply multiply the 1.5 lbs x 10 which gives us 15 lbs, the required amount to satisfy 1000 square feet of garden or lawn. A Lesco Spreader is a great little device to help you satisfy the nourishment and preventive needs of your lawn or garden. We hope that you have found this article on background and simple usage tips helpful. All the best with your lawn and/or garden this year...may a Lesco Spreader be part of it.